The Rotary Pump Market is Segmented by Type (Vane, Gear, Screw, Lobe, and Progressive Cavity), End User (Power Generation, Oil and Gas, Chemical and Petrochemical, Food and Beverage, Water and Wastewater Management, and Pharmaceutical), and Region. The global rotary pump market was valued at USD 4.756 billion in 2018. 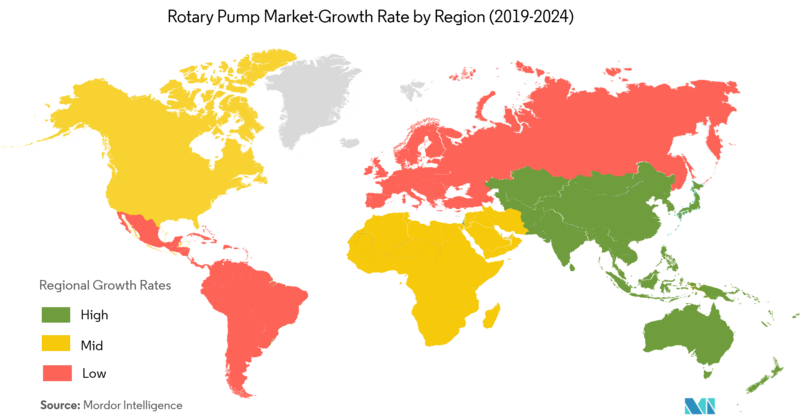 The market is expected to reach USD 5.55 billion by the end of 2024, witnessing a CAGR of 3.09% during the forecast period (2019-2024). Rotary pumps can handle high pressure and viscosity and facilitate flow, despite the differential pressure and compact design. The said advantages make rotary pumps essential in a range of industry verticals. The growing demand for food processing directly influences the growth of rotary pumps in the food and beverage end-user segment. A few areas of investment witnessed a global shift toward sustainable development in wastewater management, as wastewater exposes populations to diseases and degrades ecosystems. The demand for clean, treated water is growing in line with population, economic diversification, and water scarcity. The growing necessity for wastewater management is expected to directly influence the growth of the rotary pump market during the forecast period. 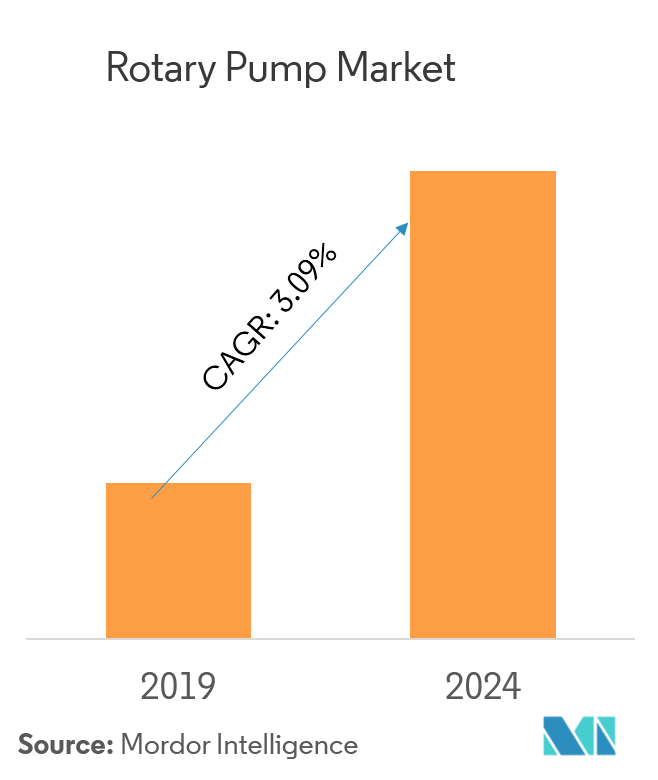 To meet the rising demand for water, activities, such as the establishment of new water treatment plants and replacement of old water treatment infrastructure have increased the growth of the rotary pump market. The leading countries in wastewater reuse are Kuwait with 91%, Israel with 85%, Singapore with 35%, and Egypt with 32%. As part of the 2016 budget, the Department of Water in Western Australia announced that USD 713 million has been committed to Water Corporation projects across the region. A rotary vane pump is a positive-displacement pump that consists of vanes mounted to a rotor that rotates inside a cavity. In some cases these vanes can have variable length and/or be tensioned to maintain contact with the walls as the pump rotates. The European food and beverage industry is the major contributor to the overall economy, ahead of all other manufacturing sectors (including automotive). The industry is the largest in terms of value added ( 1.8% of gross value addition) and a number of jobs. The industry contributes to the trade surplus, owing to product acceptance overseas. From the past decade, the export in the industry has almost doubled to reach a positive balance of EUR 30 billion. The EU government is also working to increase the competitiveness of the food sector, by creating new opportunities for trade. Consequently, complying with the growing sanitary regulations (both domestic and international), and catering to growing food consumption worldwide, is expected to further drive the rotary pump market in the region. Adoption of rotary pumps is influenced by factors, like growth in infrastructure. The Chinese government is focusing on improving the infrastructure, in order to attract additional foreign investments and manufacturing industries, thereby strengthening the overall production output. Additionally, one of the major challenges faced by the market is the increase in the cost of raw materials. The raw materials include bronze, polycarbonate, cast iron, and stainless steel, the cost of which is increasing as a result of rising inflation and supply shortage. China is expected to account for a significant share of the global electricity output over the next few years, up from 19.2% in 2010. In order to achieve this, China has implemented more than 33 policy initiatives to support renewable electricity, particularly in areas like solar and wind energy. In China, around 30-50 industrial projects were approved over the past few years, which are likely to drive the demand for pumps. 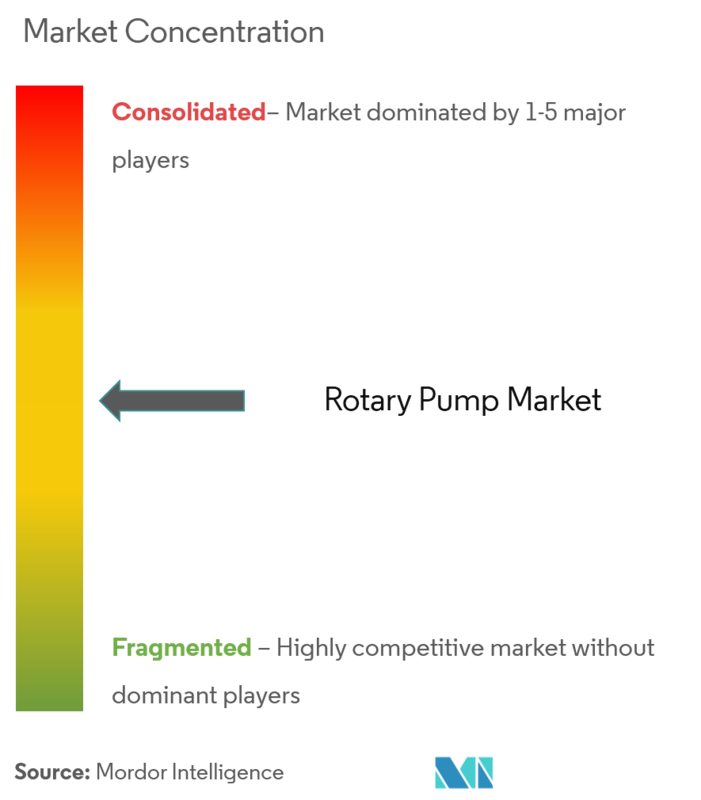 The aforementioned factors greatly influence the present tremendous growth opportunities for the rotary pump market. PSG, a Dover company and Augury announced a partnership that offers customers with data-driven actionable insights that will add unprecedented intelligence to how pumps and the systems they power are managed and maintained. This partnership will enable the existing and future PSG customers to benefit from an increase in efficiency, uptime, and resiliency through new services. SPX flow Inc. company showcased its portfolio of products, technology, and services, specifically designed for the modern demands of the industry. Some of them were the Clyde Union Pumps (CUP) API 610 and API 682 compliant multi-stage pumps and the Plenty Mirrlees W750 positive displacement, rotary twin screw pump designed for bulk transfer of liquids in the oil, marine, power generation, and chemical industries. 6.1.7 Pfeiffer Vacuum Technology AG. 6.1.10 Gardner Denver Holdings Inc.